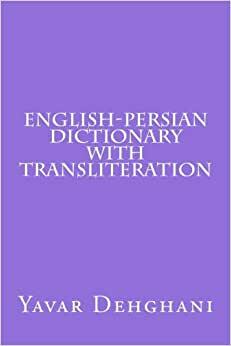 This dictionary is primarily written for English speakers, including:A) High school students in USA, Europe, and Australia and in other parts of the world who learn Persian as a second language.B) English tourists who visit Persian-speaking countries.C. Students in western defence forces who learn Persian. (For example, in Australia, we have a Persian Department in the School of Language in Defence and we have six staff to teach Persian to English students, and all these students need such a dictionary).D. All university students who learn Persian as a subject in USA, Europe and Australia.E. Other People who learn Persian for other purposes.F. All Persian migrant children in west who want to learn Persian beside English.G. All Persian speakers who want to learn English in West. Not much informative. Usefull only for beginers.